It’s not all beaches and surfing in California – the stunning Pacific Surfliner® LA – San Diego route for Train Simulator takes you through some of the US state’s most stunning scenery. It’s not all beaches and surfing in California – the stunning Pacific Surfliner® LA – San Diego route for Train Simulator takes you through some of the US state’s most stunning scenery, past golden beaches and into sprawling cityscapes. The 128 mile route between California’s two largest cities first saw Pacific Surfliner® services in 2000, and today carries more than 2.8 million passengers annually. Amtrak, Metrolink and Coaster services can be seen regularly on the route, which also hosts a varied mix of passenger and freight operations. 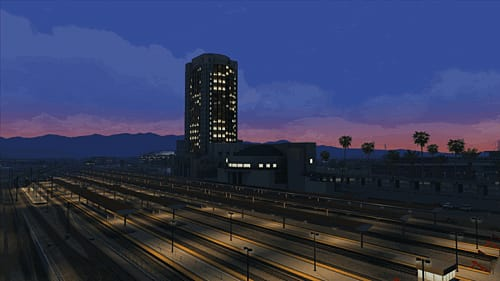 Starting out in downtown Los Angeles, Pacific Surfliner® services depart the art deco Union Station before heading into the city’s commercial district and extensive freight yards, heavy with intermodal traffic both day and night. After Fullerton (a well-known spot for railfans), the line passes the imposing Angel Stadium, home to Major League Baseball’s Los Angeles Angels of Anaheim. Many of the stations along the route are unique in style, including San Juan Capistrano, most notable for its central basilica forming part of the station building and level crossing that traverses the platform itself. Heading south, the route runs single track from San Clemente Pier, and at the same time hits the golden coast of California - the stunning beaches and spectacular sunsets are just a small part of the appeal of this beautiful route. As the route heads inland at Sorrento Valley, trains climb the challenging Miramar Hill, famed for its long incline and a serious trial for even the most powerful of locomotives. 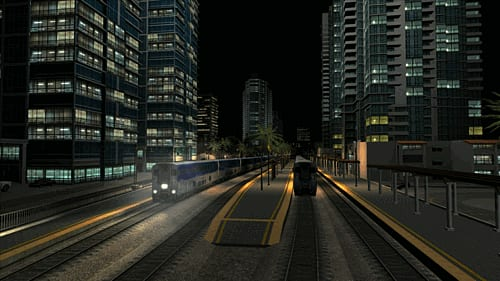 At the peak of the hill, the track divides and passenger services begin their approach to California’s second largest city and Union Station, nestled between the city’s grand skyscrapers and the southern terminus of Pacific Surfliner® services. Included with this route is the full Pacific Surfliner® consist, headed by the EMD F59PHI diesel locomotive in Amtrak livery. The F59PHI class was built between 1994 and 2001, and are a popular sight at the head of many US passenger trains. 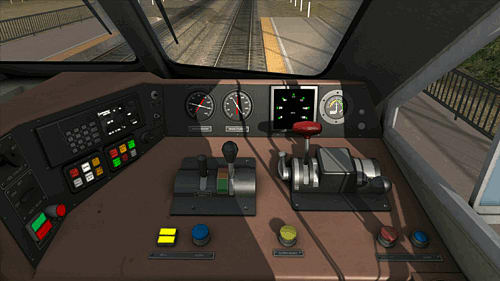 A driveable Cab Car also allows authentic operation of the Pacific Surfliner®, as the train runs as a push-pull service due to there being no turning facilities at either end of the route. The interesting mix of lazy Southern California shore towns and oceanside single-track railroading, semi-mountainous regions and busy suburban junctions, spectacular scenery and atmospheric night lighting make the Pacific Surfliner® LA – San Diego route the perfect challenge for budding Train Engineers. 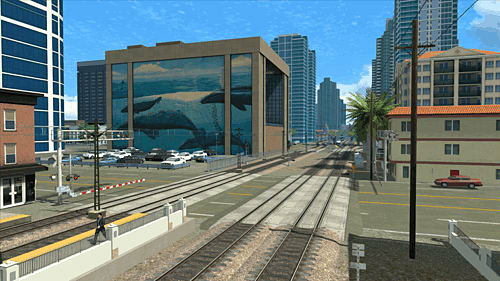 Note: Pacific Surfliner® LA - San Diego includes the Train Simulator core technology. 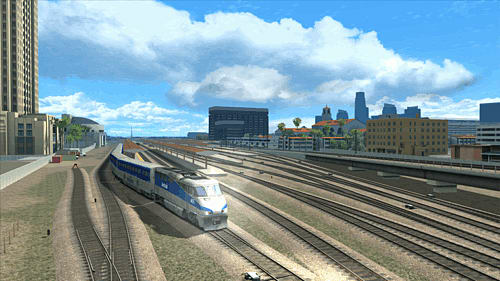 To play Pacific Surfliner® LA - San Diego, launch Train Simulator 2014 from your Steam library after purchase. Alternatively, if you already own Train Simulator 2014 you can add Pacific Surfliner® LA - San Diego to your existing collection.